This top is one of the newest arrivals to my clothing line for fall and I LOVE it (also available in a deep burgundy and pale pink). 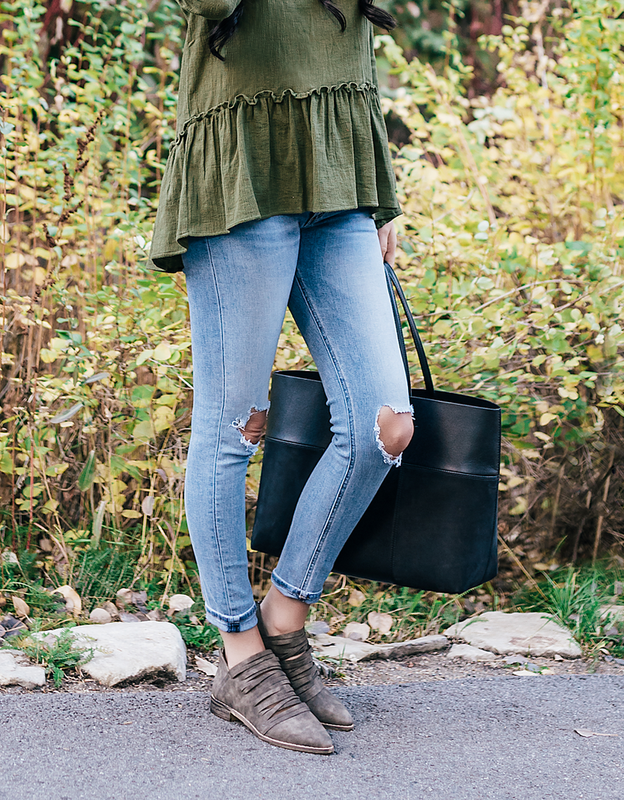 The ruffle detail instantly adds a feminine, flattering touch to your look! I hope you all have a wonderful weekend… we will be attending a few Halloween parties and decorating sugar cookies to get ready for the holiday!! On Halloween I’m going to be making this chili recipe (seriously SO amazing!) and this sugar cookie recipe with this frosting recipe. Thought I would share in case you need some menu ideas before trick-or-treating! Love your top! You make beautiful clothes! Great outfit! Love the top, it adds the right amount of femininity to it with the flair. The pale pink is my favourite. Gorgeous outfit! The top is beautiful! Thank you!! Im so glad to get such positive feedback on my clothing line! Love this top, Rach! It’s so you and looks perfect with the distressed denim. Happy Halloween! So cute! You are killing it with your clothing line! Can’t wait to see everything you have in the works. I’ll have to try the chili! Sounds delicious! Hope y’all have a wonderful Halloween weekend! Thank you Cassie! You have a wonderful Halloween weekend as well! I love that top, Rach! The color and ruffle detail are so lovely and I also love those ankle boots, too, so unique! Thanks so much for sharing and I hope you have a great weekend ahead! I love your look here especially your beautiful green top. Have a great weekend. Cute booties!! Love the neutral color and your olive peplum ia dalring! Love your shoes… Not my style but they look great on you! That top is so cute! 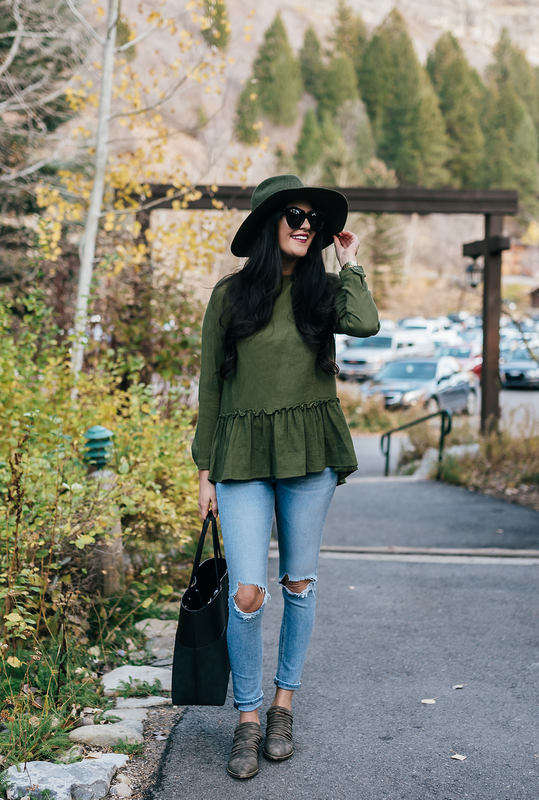 I really love how it is in Olive Green – obsessed with that color lately! This shade of green is beautiful. It really fits you. Love that the top and hat are matching! Love this casual look Rachel! Seriously love those jeans! The wash is fab. Love the new top, you look so fab as always! Have a great weekend! I love your outfit! Green is definitely your color! I will be making those sugar cookies tonight…I hope they turn out well! Hopefully they get on board. Its such a fun holiday to celebrate! I will share them! Thanks for stopping by! That top is so cute! The color is really great for fall! Love the outfit, especially the forest green top! loving this green for fall/winter! You look great and really need this top in my closet! Love that cute top!! Perfect fall color! Love your jacket! I’ve also been eyeing those boots from Banana Republic! It looks like the perfect fall weather there! Thanks! It has been great weather here! Those boots are a must-have! I love a good peplum top! So cute!